London - Ahead of the auction in London on 2 May, highlights from the Art of the Islamic and Indian Worlds Including Oriental Rugs and Carpets are touring to Dubai from 19-23 March. This is a chance for discerning collectors and art enthusiasts to view the exquisite craftsmanship and diversity of works from this category. Highlights include a monumental Imperial Mamluk Qur’an, complete with the name and date of the scribe, with a hugely impressive full page dedication to Sultan Qaytbay (estimate: £500,000-800,000, illustrated above). 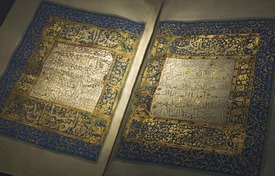 Remarkable for its elegant script and richly gilded illumination on an extraordinarily large scale, this manuscript was commissioned for the last great Mamluk Sultan, Qaytbay (r. 1468-96) and presents a rare example of the production of opulent royal Qur’ans, characteristic of the 300 year-long reign of the Mamluk Sultans. This rare volume is fresh to the market and will be presented alongside the Pommersfelden 'polonaise' carpets, two silk and metal-thread rugs from Isfahan, which have remained together since they were first woven over 400 years ago (estimate: £600,000-800,000 and estimate: £550,000-750,000). Commissioned in the Persian court ateliers of Shah Abbas the Great (1502-1722) at the beginning of the 17th century, they entered the lavish and influential court of Augustus the Strong, Saxon Elector and future king of Poland. In 1695, they were reputedly gifted to Lothar Franz von Schönborn, Archbishop of Mainz and Arcchancellor of the Holy Roman Empire where they remained in one of the most important and illustrious German baroque collections for over three hundred years. In astonishing condition for their age, they have never-before been seen on the open market and epitomise the very best of Safavid art. The sale is further highlighted by an Ottoman tombak flask (Matara) from the late 15th or early 16th century (estimate: £200,000-300,000). Of superb proportions and outstanding quality, this object reflects the refined taste of the Ottoman court. Discerning collectors can appreciate the imitation stitching which runs along both sides of the upper ‘seam’, a feature deriving straight from the leather originals. A truly magnificent piece of early Ottoman metalwork, this is an opportunity to acquire a museum quality piece - there are two other known examples of this form in tombak, one resides in the Metropolitan Museum of Art, New York, the other in the British Museum. Also on view in Dubai is one of only four paintings made by the remarkable and defiantly individual Muhammad Murad Samarqandi. Produced in the early 17th century, Four Young Scholars in Discussion, bears the signature of Muhammad Murad Samarqandi, an enigmatic artist whose rare works were created at a time of profound change and development in the Iranian and Indian artistic worlds (estimate: £200,000-300,000). Planispheric astrolabes were generally used for charting astrological bodies, finding the direction of the qibla, and determining the times of prayer. The auction features a fine Safavid brass astrolabe from the 17th century Safavid Iran, a period which experienced a resurgence in astrolabe-making of the most ornate designs (estimate: £100,000-150,000). Superbly and accurately engraved, the present lot was made by Muhammad Zaman, a highly celebrated astrolabist and astronomer who flourished in Mashhad during the second half of the 17th century. Only a handful of astronomical instruments made by Muhammad Zaman have survived, making this example truly unique, and a true testament to the scientific knowledge and ability of the maker.